Add customized, channel-specific content with Swrve’s new campaign workflow. Swrve’s streamlined campaign workflow gives you several options to set up, customize, and manage your campaigns. Email and SMS are the first channels to use this new workflow. Presently, there are no changes to how you add content to your push notification, in-app message, or Conversation campaigns. Email and SMS campaigns are currently available as part of our Early Access program. To have these features enabled for your app, contact your CSM at support@swrve.com. To add or edit your campaign content from the campaign build screen, on the Content block, select add + or edit . The options available for adding content depend on the campaign channel and provider. 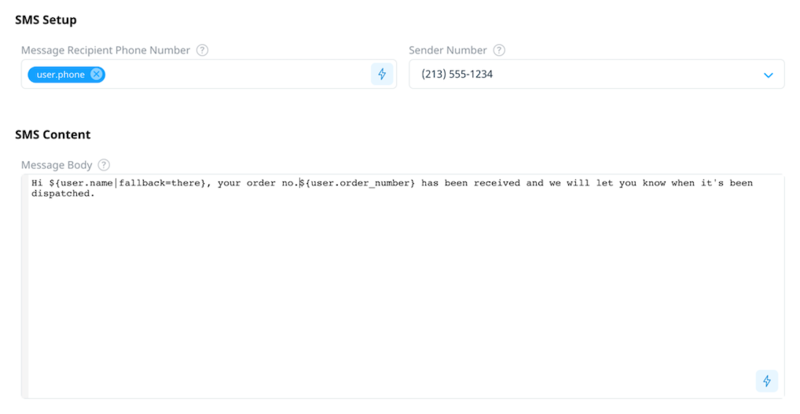 The following instructions use SendGrid as the provider for the email example and Twilio for SMS. Certain boxes include the option to personalize your content with custom user properties—for example, the user’s name or email address. If relevant, select Insert property to display the Insert a user property dialog. Select the Select item box to search for and display a list of custom user properties, then select the property you want to use. If you want to include fallback information, select Property fallback support. To include fallback text for the property value, select Add custom text and then enter the fallback value. If a user doesn’t have a value for the property, the fallback text is used instead. If you select Don’t show, the content isn’t displayed for that user. Select a tab for details on how to add content to third-party email or SMS campaigns. Email setup is where you enter the sender, recipient, and subject information for the email. To include custom properties with any value, select Insert property . From name: Enter the the sender’s name. From email: Enter the the sender’s email address. To: Select Insert property to select the user property that contains the recipient’s email address. Subject: Enter the subject for the email. Select an option for adding your email content: template or HTML/plain text. For third-party party email, templates are managed in your third-party system and then are available to select from the Template ID list. Select a template from the list and, if required, use the Substitutions section to personalize the email template with user-specific values. 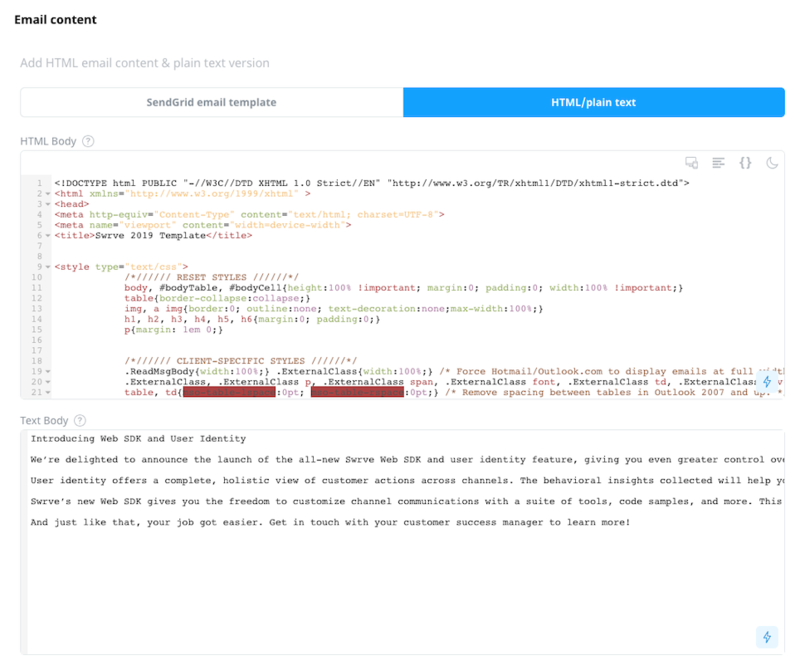 Each substitution tag in the third party email provider can be mapped to an appropriate Swrve user property to populate a list of replacement text for that tag in the email template body. Select this option to enter your content in HTML and plain text. Send test email Enter an email address to send a test email. Preview Display a preview of the content and layout of your message. Prettify your HTML Select this to give the code a more readable structure. Toggle line wrapping Select this to fold/unfold the text and hide sections of the code to provide a larger working area while focusing on smaller chunks of HTML. Toggle theme Use this to switch between a dark and a light background. Select your message recipient and sender details and enter your message content. To send a test SMS, select . Enter the number you want to send the message to using international format (for example, +12135551234), and then select Send. Message Recipient Phone Number: Use the Insert property dialog to select the custom user property that contains the destination phone number. Sender Number: Select the phone number, short code, or Messaging Service that sends the message. For Twilio, this is a Twilio phone number that you own, formatted with a ‘+’ and country code, for example, +16175551212 (E.164 format). You can also use a Messaging Service SID. Message Body: Enter the text for the message you want to send, limited to 1600 characters. To include custom properties values in your message text, select Insert property . When you have finished adding your content, select Save. Set custom goals to measure the success of your campaign. For more information, see Campaign goals. Define your campaign audience. For more information, see Targeting campaign audiences. Schedule and launch your campaign. For more information, see Scheduling your campaign.